In May and June I've exchanged 33 emails with Łukasz (main developer). Right now the number in brackets is 20. For God's sake - I'm still unable to run the programme, not to mention introdicing any new features! Right now I'm trying to run in on other mashine (father's laptop) and other OS (Vista). Still the same errors, from my own experience the solution is very easy (like adding some packages to the classpath), but when I asked for any suggestions the answer is - "it's working". No, it isn't! 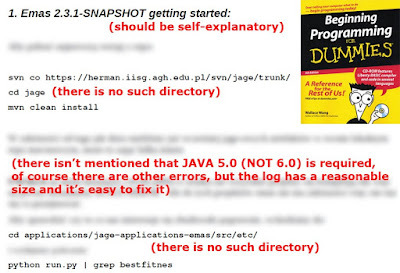 The Java SE release that you requested has already announced its End of Service Life (EOSL).